All next week is Hard-to-Find Week on the MUA nail board. In preparation for the festivities the girls, myself included, have been rummaging through stashes in order to find those elusive polishes we all love so much. So I decided that I’m going to dedicate the next few posts to my favorite hard-to-finds. To kick things off, I present to you, a flash back to the year 2000 – Cover Girl Crackle Lacquer. These two are Halloween themed, Boo Hou and Jack-o-Lantern, but if my memory serves me, there was a full line of these. I think I remember owning a white one that I used to layer over black nail polish. Oh ho, my teenage self was *so* edgy. If I had it now, I would use it over gold polish to rip off the MAC Antiquitease mani. 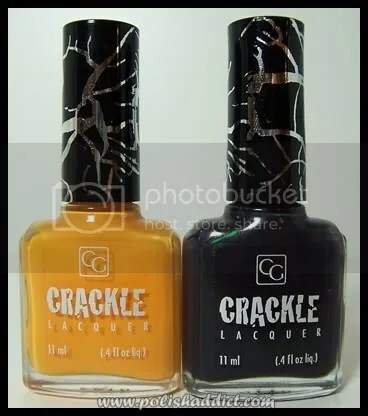 Crackle actually has an interesting back story (here’s the original press release), apparently the person who invented it did so by accident while trying to invent something else- then tweaked the formula to be marketed as cracking nail polish. The patent is held under the title “Nail Enamel Composition Having Decorative Appearance”, which I find highly amusing. This bottle of Crackle was given to me by MUA’s lovely lindyspendy. I almost died when I got it since I’d been hunting Crackles unsuccessfully for a long time. Seriously, opening that package was like opening Tutankhamun’s tomb. The formula has thinned out over the years. This bottle may very well be over 8 years old. 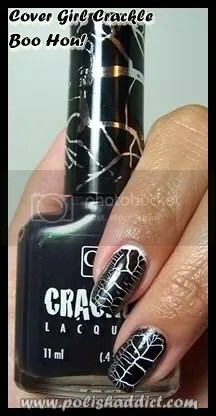 You can’t really do multiple layers with Crackle so there’s no way to curb the thinness of the formula – but – I actually think it actually looks cool over black. The thinness gives it an eerie faded quality. 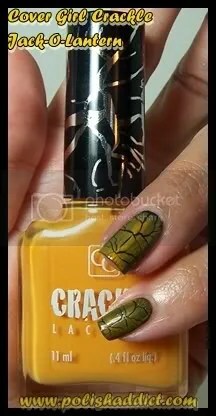 This bottle of Crackle is from evilbay. It was a bit pricey but not horrible, totally worth it. This bottle’s formula was too thick, also probably from age. However, it dried with excellent cracks, so I won’t complain. You guys will notice I only swatched 2 nails for each color whereas I usually do a full hand. That’s how special this polish is too me, I feel bad putting it on just to take it off!